For businesses looking to start an IoT project, finding a way to quickly test out an idea or validate a hypothesis is a daunting task. There are a lot of things to consider for an IoT solution—first of which is connecting a device. There are multiple hardware platforms, and many are fragmented in interoperability and compatibility between devices. Two years ago, Microsoft first launched the Azure Certified for IoT program to help customers ensure their device of choice was tested to work with Azure IoT technology. Today we go one step further by expanding the Certified for IoT portfolio. We are excited to announce a new starter kit certification in the Azure Certified for IoT program to enable hardware manufacturers to certify their IoT kits for Azure. The family of third-party kits, known as Microsoft Azure IoT Starter Kits, provide users with everything they need to get started with Azure IoT in minutes, and move quickly from idea to prototype to production. Each kit consists of development boards, sensors, actuators, and is bundled with user-friendly online tutorials that help users seamlessly connect to Azure IoT. We are working with hardware partners to certify their IoT starters kits, including Advantech Corporation, Espressif Systems, ICP DAS, Microchip Technology, Nexcom, and STMicroelectronics, among others. You can easily find all Certified for IoT devices and starter kits on the Azure IoT device catalog, and filter by requirements such as device type, operating system, programming language, among others. Each device and kit page has detailed product specs, button to request more information from the hardware manufacturer, and instructions on how to connect to Azure IoT Hub. Our expanded “Get Started” tutorials provide visual step-by-step guides to help you implement your IoT scenarios. Do you want to certify your developer kit? If you are a hardware manufacturer, we encourage you to get started with certifying your device or kit. Being part of the Azure Certified program allow you to increase the discoverability of your hardware offerings, gain trust with your customers, and enable them to get started with their IoT projects quickly. 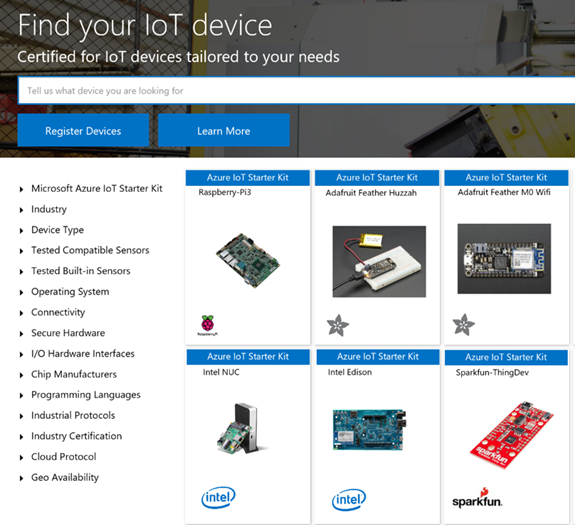 Go to Azure IoT device catalog and click on the Partner Portal (upper right). Register as a partner if you have not done so already. After approval, your device will be automatically showcased on the device catalog. After approval process, your kit will be showcased on the device catalog. We are very excited for the opportunities that this new program enables, and are looking forward to helping our customers quickly move from idea to prototype to production. Explore certified devices and Azure IoT Starter Kits by visiting www.catalog.azureiotsuite.com/kits.